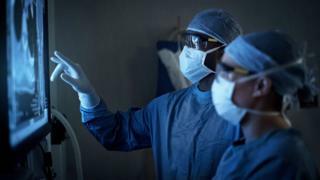 NHS hospitals could carry out 280,000 more non-emergency operations a year by organising operating theatre schedules better, a new study suggests. The research, which looked at data from 2016, found more than two hours were wasted each day on the average operating list. The study says avoidable factors like late starts led to the loss of time. The analysis, seen by the BBC ahead of publication, looked at theatres in 100 NHS Trusts in England. A total of 1.64 million routine surgical procedures were carried out in 2016, including eye, ear, nose and throat operations and orthopaedic procedures. Routine operations are considered non-emergency, and each surgical team will have a daily operating theatre list of patients who are scheduled to go under the knife. Waiting times for routine operations are going up and there is an ongoing debate over whether more money is needed for the NHS or whether it could be more efficient. The report, by regulator NHS Improvement, says it is not a question of getting surgeons to work harder. Instead, planning lists more effectively and reducing late starts and early finishes would have made a big difference, it argues. Working hard to eliminate last minute cancellations by better pre-op planning enabled one hospital to significantly improve its performance. The health regulator is keen to get hospitals to make better use of their assets. NHS Improvement's Steve Russell says: "We hope this analysis will enable them to identify bottlenecks within their systems to ensure operations are scheduled more appropriately and more patients receive the care they need quickly." Croydon University Hospital started overhauling the way it runs operating theatres two years ago. Pre-op assessments now take place much earlier, meaning late cancellations, which leave slots empty, are less of a problem. Patients are also sent reminders ahead of the procedure. Together this has reduced on-the-day cancellations from 12% to 7%. Theatre staff also arrive earlier to ensure lists start on time and sessions are allowed to overrun to stop early finishes when doctors consider there is not enough time to operate on the last patient of the day. It means the trust is able to see more than 1,200 more cases than it did in 2015-16, bringing in an extra £1.9m of income. Surgeon Stella Vig says the changes have made a "huge difference to the numbers of patients we've been able to get through our theatres". The medical world does not dispute the idea that the health service could make better use of facilities but some argue that it shouldn't be seen as an answer to all the problems. How do you meet the NHS's funding demands? Professor Derek Alderson, president of the Royal College of Surgeons, says many of the problems are caused by bed occupancy rates in hospitals being too high. "The logjam effect is a very major problem because the hospitals are completely full virtually all of the time," he told BBC Radio 4's Today programme. "So if you need an intensive care bed and yesterday's patient is not well enough to leave the intensive care unit, that day's operating list cannot start. "It's frustrating and it's very wasteful," he added. Resolving some of the causes of inefficiency could also be outside the scope of the NHS. Some of the unused theatre time could be explained by problems finding beds for those who need to stay as in-patients. Delayed transfers from hospital of medically fit patients because of shortcomings with social care have put pressure on bed capacity. The idea that some operating theatre capacity might be lying idle will be used as ammunition by those who say efficiency should be the health service's main priority. But is it really that simple? Doing more operations when highly skilled surgeons and theatre staff are there anyway for their lists makes sense. The hospital is paying the salaries and overheads so it's logical to get through as much work as possible. But while extra operations bring in more income for the hospitals, they still have to be paid for by local health commissioning groups and their resources are stretched already. The efficiency versus more money debate will not be resolved definitively. The NHS has to find ways of doing more for the same amount of money, with patient demand rising faster than the resources available. But that will not stop calls for a significant boost in government funding for the NHS beyond what is currently planned. NHS Improvement's study excluded all lists which were cancelled and ruled out any unused time which was less than average for a surgeon. It also allowed for 5% of time to be lost owing to last minute cancellations.